2. What's Robert Plant's nick name? 3. What's Jimmy Page's nick name? 4. 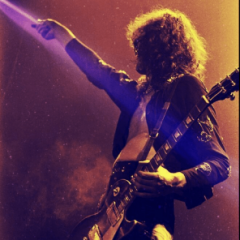 Where was Jimmy Page born? 7. In what Michelangelo Antonioni film did Jimmy Page appear? 8. What song did he play? 10. What instrument did JP first play with The Yardbirds? 11. What was the comment that inspired the band name? 14. Whom did they cover in "Babe I'm Gonna Leave You?" 15. On what Donovan song does Page play some truly weird stuff? 16. Where did the Hindenburg catch fire? 17. Under what flag did it fly? 18. Why did it catch fire? 19. On what album is there a photo of the crash? 20. Which songs did Page play on his first television appearance? 21. What did Page want to do when he grew up? 22. Why did he say he didn't want to be a doctor? 23. What did Page wear at The Royal Albert Hall concert? 24. What is the name of the band's manager? 25. What did he do that was unprecedented for a band? 26. What did Page usually carry on board their plane? 27. Which of the band members hated touring most? 28. What was the nickname of The Hyatt House in Los Angeles? 29. What were band members (except for Page) accused of abusing a groupie with? 30. Did Robert Plant admit it? 31. Who almost always travelled to tours on his own? 32. What is the recurrent object in the Presence cover art? 33. Where was the cover of Physical Graffiti photographed? 34. What is still the most expensive album cover art to ever have been produced? 35. Why was it so expensive? 36. What Swiss Jazz festival did the band play? 37. What was their biggest hit single? 38. When did they first appear on the Ed Sullivan show? 39. When did they appear on Top of the Pops? 40. What LIVE album did they release while they were touring? 41. Did the band break up because of Yoko? 42. If not, why did they break up? 43. When do they sing about my favorite fabric? 44. Who first sang the lyric "Squeeze my lemon"? 45. They've been the rune of many a poor girl...What is the name of JP's 14-year-old girlfriend? 46. On which album is Page wearing a bomber jacket? 47. When did they replace Pete Best with Bonzo? 49. What automobile company used Rock 'n'Roll in a television ad? 50. What was the name of Page's favorite guitar that disappeared? 51. Where was the first ever concert played as Led Zeppelin? 52. How many times did they play at Madison Square Gardens? 53. What kind of amps does Page use? 54. What kind of amp heads. 55. Tube or solid state? 56. Other than Skiffle what was he playing at 14 with his teacher? 57. Fill in: name non-zep songs which they covered in their medleys. 58. On which songs did they have medleys? 59. By whom was "The Crunge" inspired? 60. What is Robert Plant's middle name? 62. What is John Paul Jones's real surname? Xtra points for Pirate English. 63. In their songs are sexual doub-- really single entendres. Name some. 64.Who is Roy Harper and why should we take our hats off to him? (I don'tknow the answer to this one-- some nob on a rock who interrupts pagewhen he talks). 65. We know Page rocks. Name 3 other distinct guitar styles he uses. 66. What's the difference between Bron-y-Aur Stomp and The Bristol Stomp? 67. What or where is Bron-y-Aur? 68. Who is frequently seen wearing a herringbone overcoat, hat and full beard? 69. Who frequently wore a bowler hat? 70. Who almost always had a mustache? 71. What is Page doing when waving hands around during WLL solo? 74. What instruments are used in Stairway to Heaven? 75. Where does Robert Plant come from? 76.Which member was snubbed at a Rolls Royce store, then took out cash forthe car and threatened to tear the salesman a new one? 77. Which two drove to Morocco together? 79. What did Eric Clapton say when asked how it felt to be the best guitarist in the world? 80. Which of the members reads charts and conducts? 81. What was JP photographed chugging, literally bottoms up? violins, celli, viole, contrabass... full string section. 83. What song did Plant and Elvis start singing together to break the ice when they met? 84. In what year and in what venue was Stairway to Heaven first played? 85. What instruments are used in Going to California? 86. What instruments does JPJones play...except for his famous organ? 87. Was it the White Album on which the LZ name does not appear, if not,on which one? 88. Who wrote Killing Floor (part of Lemon Song) hint: not Page/Plant. 90. Who, reportedly came up with the riff for Black Dog? 91. Where was it recorded. 92. Why is it called Black Dog? 93. In what song do they make specific reference to Tolkien? 94. Give the proper name used in the reference. 95.How did Page describe Plant's voice upon hearing it? Hint: he says itstill is (after years of hearing it, not at 02 in 2007. 96. In what song are the lyrics" standing on the corner of Bleecker and nowhere?" 97. In what song are the lyrics: "mmmmm, I'm tellin' you now; greatest thing you ever can do now?" 98. In what song are the lyrics:"the river's red?" 99. In what song are the lyrics "baby it's crying time?" 100. What does Coda mean? in music? literally? 101. Why did they drop the a from lead? 102. What acoustic guitar does page use in Going to California? 103. In what song are the lyrics: "let your daddy see?" 104. In what song are the lyrics: "You need schoolin' baby I ain't foolin. I'm gonna send you,yeah, back to school . Way way down inside..Woman you need it." Take your time on this one. It's tricky!!! I'm gonna give you my quiz. I just gave you every inch of my quiz. Wo-man....I said...Wo-man.... you need looooooooooooooove"
You took my led zeppelin quiz. you took my led zeppelin quiz. 105. In what song are the lyrics "I don't know what I like about you but I like it a lot?" This is a great quiz, but I can't find the answers. The link isn't working? Great quiz. Don't forget the references to Tolkien in 'Battle of Evermore'. Have a look at my 'Led Of The Rings' post. Question 84: Where was Stairway first played? If I remember correctly, it was in Ireland, wasn't it? I can't remember if it was Dublin or Belfast. Please correct me if I am wrong. I am going by memory and am too tired to look it up tonight. I am going from (faulty?) memory here, too, and saying it was in 1971? And I believe that they played it live at a concert in Ireland before the album IV came out at the end of 1971, so no one had heard it before when they first played it. Edited to say: I believe that the audience was underwelmed by the song at that concert when they first heard it. And while you're at it, someone point out to the quiz guy that the Tolkien character's name is spelled Gollum, and that the Golem is a different concept entirely. I quickly read through all the answers to your Great Zeppelin Quiz. I must say that two (2) of your answers are actually (and factually) incorrect. Question #18: Why did it catch fire? (the Hindenburg). Your answer: "It was filled with Hydrogen, lightening caused a fire on the aluminum skin". I have read (in books and not the internet) that the Hindenburg burst into flames over Lakehurst, New Jersey because of static electricity. The static electricity caused sparks that collided with the hydrogen thus causing the explosion, not lightening. Question #51: Where was the first ever concert played as Led Zeppelin? Your answer: "Gonzaga College in Washington State". I do know that this is actually very incorrect. Plus, this question is very ambiguous. "Led Zeppelin" made their debut as Led Zeppelin on Friday, October 10, 1968 at Surrey University in Surrey, England. Led Zeppelin made their London debut on November 9, 1968 at the Roundhouse (obviously in London). If you actually meant "Where was the first ever concert played as Led Zeppelin?" in the United States, well that answer would be on Thursday, December 26, 1968 at the Denver Auditorioum, Denver, Colorado. Led Zeppelin played Gonzaga University four (4) days later on Monday, December 30, 1968. As far as I know this is the first American gig by Led Zeppelin to be recorded and bootlegged. Of course I do not claim to know everything about Led Zeppelin, however, I do believe I am correct about these two (2) questions and with my answers. If I do happen to be incorrect, I would really appreciate that someone please correct me. I shall punish the afformentioned scribe of the quiz with some evil medievel torture instrument like the pear of anguish or something for her mistake, and yes you are correct with the Gonzaga gig, maybe she meant first recorded. I dont know when my self, but the early 1970's was right at the start of the "album years" of popular music. With that in mind it doesn't supprize me that it was not very well embraced at first. Hell, the short bit writing of the Beatles was still going very strong in 1971, and the FM radio craze was just getting started to, yeah, FM had been around for some time but not in the genaral sence. It would be a few more years (mid/late 1970"s) before the long version was the big thing, I do remember the cut version's of the long song's of that time frame, I was young but that was about the only thing I didn't like about AM radio. 16. Where did the Hindenburg catch fire? New Jersey or some other place in the northeast. 18. Why did it catch fire? static electricity I think that built up and ignited the gas? 23. What did Page wear at The Royal Albert Hall concert? Levis, a sweater vest, white or light blue button down and white sneakers. 25. What did he do that was unprecedented for a band? They cut out the middle man got a higher % of the ticket sales. 26. What did Page usually carry on board their plane? Himself? 30. Did Robert Plant admit it? He says he doesn't remember also read where he said he was with his wife. 51. Where was the first ever concert played as Led Zeppelin? I should know this ARGH! 54. What kind of amp heads. Marshalls? 63. In their songs are sexual doub-- really single entendres. Name some. "Every Inch of my love" , "Squeze my lemon"
95.How did Page describe Plant's voice upon hearing it? Hint: he says itstill is (after years of hearing it, not at 02 in 2007). a sonic boom? 103. In what song are the lyrics: "let your daddy see?" ???? OOOPS How did I screw that up. My only defense is well .......a brain fart. I'm sure I didn't get them all right, some I didn't know. I was trying to answer them quickly and no references. But missing that YIKES!!!!!!! Thanks. I went to the site to find the answers but its closed they're working on it or something. Nope, they sang "treat me like a fool treat me mean and cruel" which is the song called "love me"
According the Richard Cole book he also got called " the old lady" for the time he spent to doll himself up before a concert. Yes i always thought that was great apparently worried about his hair, I've also read he would ask that windows be rolled up in the car as the breeze would mess up his lovely hair doo.